We welcome all adult and pediatric patients and have treated patients from all over the United States and several countries. Our goal for each patient is to provide comprehensive, multispecialty evaluation of your tumor and to outline and manage a detailed plan for your personalized care. UI Health Care holds ten dedicated neuroendocrine tumor (NET) clinics weekly, with an average of 35-40 adult patients seen per week, 20-25 new patient consultations per month, and more than 1,500 patient visits per year. We also see about 25-30 children and adolescents with NETs per month, with about 350 patient visits per year. Adult and pediatric NET clinics were established at the University of Iowa in 1999. Physicians and researchers at Holden Comprehensive Cancer Center also offer the nation’s only neuroendocrine cancer SPORE, or Specialized Program of Research Excellence, granted by the National Cancer Institute. This funding allows physicians and researchers to collaborate on studies aimed at preventing, detecting, diagnosing, and treating neuroendocrine cancers. Whether you self-refer or a referral is received from your local physician, we will request a comprehensive list of important medical records. Importantly, if you have had a biopsy performed, we request tumor tissue for verification and possible reclassification of the tumor. All medical records and original tumor classifications are reviewed before the patient arrives for their first visit. This pre-visit review determines what imaging, laboratory testing, and additional consultation with surgeons or radiologists should be performed at your first visit. Based on your individual goals and preferences and our initial assessments, the best therapeutic options are determined and scheduled. Return appointments to our clinic are scheduled as needed, and all patients are followed on a regular basis by their primary medical oncologist, for whom we serve as therapeutic consultants. After the first visit, each patient’s medical history, pathology, imaging, genetics and previous surgery is reviewed by a team of specialists, whose recommendations are communicated to you and your referring physician. All patients are offered the opportunity to participate in the Iowa Carcinoid/NET Registry. Patients who are eligible and consent to participate in the Carcinoid/NET Registry are informed when new clinical trials begin recruitment. Additionally, the Registry consent form allows for the collection of tumor tissue removed at surgery to be used for genetic studies and generation of patient-derived xenografts. While voluntary participation in the Registry may not be of immediate benefit to a patient, these genetic and xenograft studies offer each patient the opportunity to directly contribute to clinical and basic research to improve the length and quality of life for all patients with carcinoid and neuroendocrine tumors. ​​At University of Iowa Holden Comprehensive Cancer Center, our highly experienced physicians and staff are dedicated to taking care of you, not just your cancer. As part of a nationally recognized cancer center, we are on the leading edge of neuroendocrine research, always searching for ways to make the best cancer treatment even better. Our team comprises of top researchers finding new, innovative treatments and therapies, as well as identifying genetic links that may pinpoint risk. We bring experts from different fields of medicine to work together in a multidisciplinary oncology group. Since many neuroendocrine patients require more than one form of treatment, our team meets regularly to discuss the best course of treatment and works together to design the best personalized plan for every patient. The team includes Surgical Oncologists, Endocrine Oncologists, Medical Oncologists, Radiation Oncologists, Social Workers, Pathologists, Pediatric Oncologists, Pharmacists, Nurses, and laboratory-based Scientists. Holden Comprehensive Cancer Center is the only institution in Iowa to hold the prestigious designation of being a Comprehensive Cancer Center by the National Cancer Institute (NCI). NCI-designated Comprehensive Cancer Centers are rated in the top 4 percent of the approximately 1,500 cancer centers in the United States. A recent study published in the journal Cancer showed that patients treated at NCI designated cancer centers have better survival outcomes than patients treated at non-NCI designated cancer centers. Our doctors and staff stay on top of the newest developments in cancer research, treatment, and diagnosis to offer all of the services you need for your neuroendocrine care. Our multidisciplinary team of experts with expertise in clinical, laboratory, and population-based research will design a treatment plan tailored to your needs. We know no one wants to stay in the hospital longer than necessary, so we work especially hard to make sure your treatment options are done on an out-patient basis, allowing you to rest in the comfort of your own home. Experts focused primarily on neuroendocrine cancer. Our team of specialists have been researching neuroendocrine cancers for decades. They understand the disease, know about the most recent treatment options from surgery to chemotherapy, and can help you determine what is best for you. Read more about how Holden Comprehensive Cancer Center probes this rare cancer. Innovative clinical trials. We not only offer access to the most recent treatment methods and therapies but our physicians are also neuroendocrine researchers, placing them right in the heart of the latest breakthroughs in neuroendocrine cancers. Our researchers received the only Neuroendorcine SPORE (Specialized Programs of Research Excellence) grant in the country, a grant consisting of four independent NET research projects and clinical core facilities, from the National Cancer Institute. Access to the highest resolution scanning equipment for diagnosis and treatment. Our doctors use the Gallium DOTA-PET (positron emission tomography) scanner which provides fast, three-dimensional scans that are among the highest resolution available for diagnosing neuroendocrine tumors. Multiple treatment options. Each neuroendocrine diagnosis is different, and each treatment option should be, too. Our doctors and staff work with you and create a treatment program that will best fit you and your cancer. At Holden Comprehensive Cancer Center, we use peptide receptor radionuclide therapy (PRRT), a molecular therapy used to treat neuroendocrine tumors (NETs). New infusion suite designed with patients in mind. Our infusion suite was designed with patient input to create a comfortable, welcoming environment. 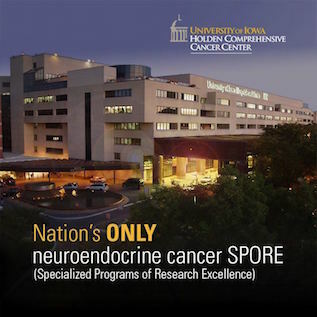 Researchers at the University of Iowa Holden Comprehensive Cancer Center have received a five-year, $10.67 million Specialized Programs of Research Excellence (SPORE) grant to study neuroendocrine tumors. This is the first and only SPORE grant ever awarded to fund research on neuroendocrine tumors. A great deal of research is done behind the scenes in laboratories, long before clinical trials can even begin. Clinical trials are research studies that test out the latest treatments and drugs that are not yet available to the public. These new treatments have the potential to improve your quality of life or increase your chances of survival. See a full list and learn more about neuroendocrine cancer clinical trials at Holden Comprehensive Cancer Center.